Found: $5.7 million dollars’ worth of weed. If it’s yours, you might want to rethink any ideas of claiming it from Italian authorities. Italian police stumbled across a pretty large amount of weed, said to be worth almost six million dollars, abandoned on a beach. 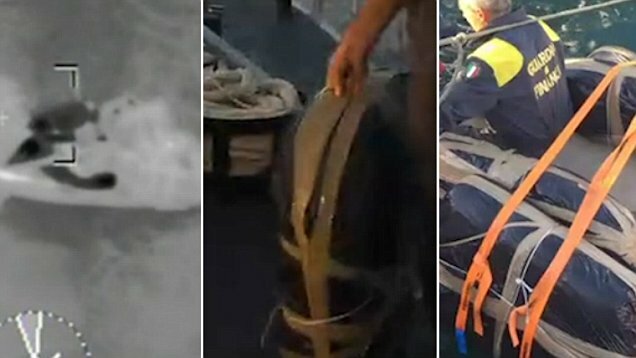 They also found was an inflatable boat, too, which was allegedly used to smuggle the weed into the shores of Porto Recanati. So, just how much weed can you get for $5.7 million? In this particular case, the Italian authorities have said that the haul weighed over 1500 pounds, which was found in 28 separate bales. The über stash was found during what was a pretty routine patrol of the northeast coast of Italy, after an open gate prompted the police to investigate further, which was bad luck for the would-be smugglers. According to Captain Enzo Marinelli, it is said that the smugglers, who are thought to be from Macedonia or Albania, were forced to come to shore by a combination of bad weather and a passing police patrol. The haul was being transported in a 32-foot inflatable boat with twin 200-horsepower outboard engines, which was obviously needed to get the 1500 pounds of weed across shores. But Italy isn’t the only Mediterranean nation to be dealing with drug-smuggling rings, as Greece‘s Hellenic Coast Guard recently announced that it had discovered and broken up a smuggling ring that was transporting drugs from Albania to Italy, also using fast speedboats. The bust resulted in officers arresting two Greek nationals and five Albanians. During that operation, which was a joint operation with Italy’s Guardia di Finanza, the Hellenic Coast Guard also seized two of the customized speedboats and 3300 pounds of weed, making it a successful weekend for the authorities (and definitely not for the smugglers). Even though it used the same type of transportation, the officers stated that is is not clear whether the Greek bust and Italian discovery were linked in any way. When it comes to dramatic busts, neither of the aforementioned incidents are as exciting as the police chase in Italian waters, which ended up with two Albanian men attempting to smuggle $2.2 million dollars’ worth of weed on personal watercraft. It came about after the coast guard spotted the high-speed watercraft traveling across the Mediterranean Sea from Albania, which led Italian officers to chase and capture the two men, who were heading towards the southern town of Bari.